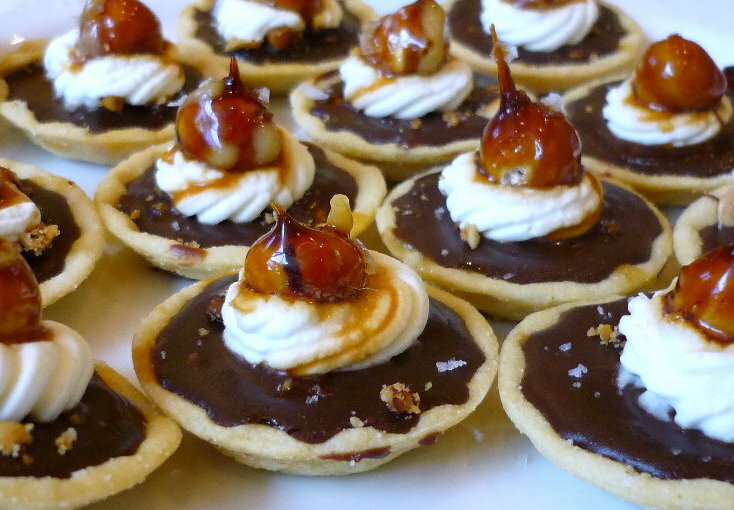 Described by a friend as very posh Nutella, the filling of these little tarts is a thick glossy chocolate ganache, and yes it sort of does taste like posh Nutella - in fact you can use Nutella if you are pressed for time, why not? If you have the time though, this version is well worth it. The tart bases are simple sweet shortcrust pastry discs cooked in patty pan tin and press down with the edge of a spoon. Of course if you prefer use pre-made tart shells or store bought pastry. As long as it tastes super, who really minds? 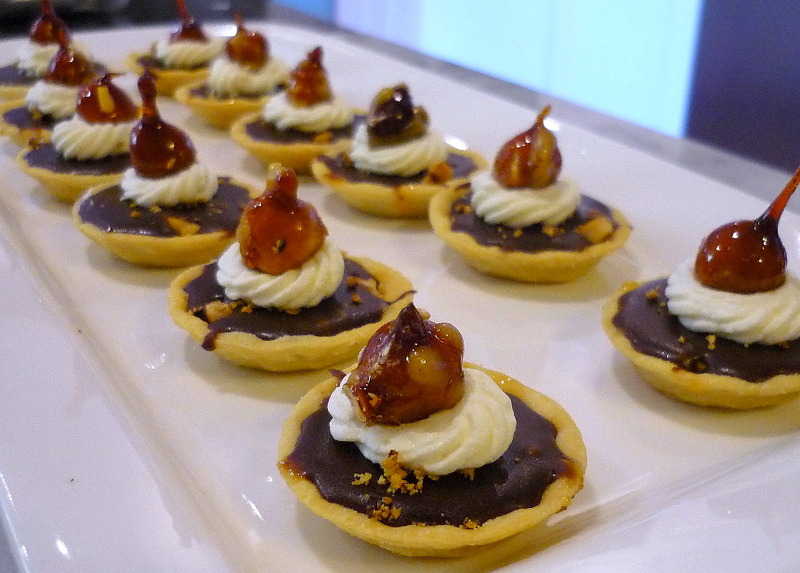 One caution I would offer is that these are best kept as little tarts rather than one large one. I would also recommend making the caramel and roasting your hazelnuts before you start the chocolate filling - it makes everything so much easier! In a mixing bowl, beat the butter with a wooden spoon until light and fluffy.Gradually add the sugar, and then the egg yolks. Once combined, add all the flour at once with a pinch of salt and cut through with a knife.Once the dough starts to come together, knead well for 2 minutes, then immediately wrap the pastry in plastic and refrigerate until needed for baking. This pastry is best left to enrich and rest overnight or for a few hours before use. Do not overwork the pastry or it will become brittle – it is best made quite quickly then left to rest before use, rather than trying to force it into compliance as soon as it is made.It can be kept in the fridge for up to 3 days before use, and can be frozen until needed.. Once you have added the flour, do not overwork, this pastry is quite delicate. Chill for at least an hour before use - if you do not need all the pastry, freeze at this stage and just use the portion you need. Remove pastry from the fridge, and roll it between two sheets of baking paper. Line your tart pans with the dough and bake your pastry shells until they are golden brown. If using pre-made ones, just warm them a little in the oven to ensure they are very crisp. Set your pastry shells aside to cool. In a high sided saucepan heat the sugar with a little water until it bubbles up and just starts to go golden brown. Remove from the heat and allow the mix to cool. Once cooled a little it is ready to use to line your pastry shells and can also be used to caramel coat hazelnuts. To coat the hazelnuts, use a satay skewer and secure a single nut on the end lightly (don't press too hard or the nut will crack) Dip the nut into the caramel repeatedly until it is glossy and starts to trail a caramel tail. Lay on its side to cool. Into each pastry case, add a few crushed hazelnuts and then trickle in some of the caramel - just a tiny amount, enough to stick the nuts down. Leave the shells at room temperature, do not chill. Crush the chocolate and place in a large glass or heat proof bowl. Warm the cream with the brown sugar in a saucepan over a low heat - stirring constantly - until it is just too hot to dip your finger in (or just below boiling point - do not let it boil). Add the butter and allow it to melt, then pour the cream mix over the broken chocolate pieces. It is the addition of butter that makes this mix so shiny and unctuous - however if you are really troubled by it it can be omitted. Allow the heat of the cream mix to melt the chocolate without stirring it. Once the chocolate is fully melted add the Frangelico and mix gently. Leave the mixture to cool until it is at blood temperature. 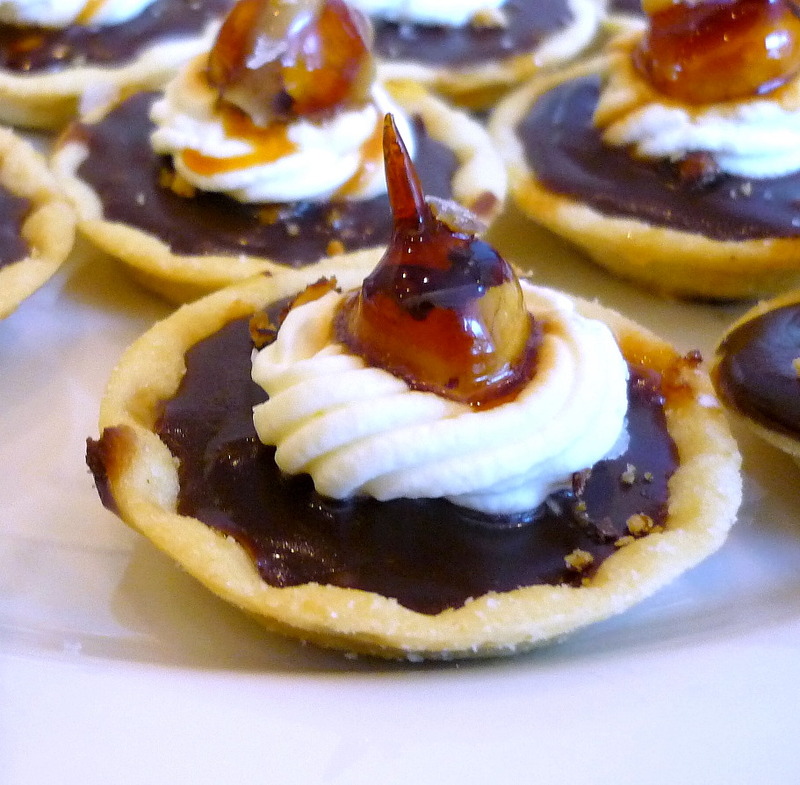 Once cooled, pour the chocolate ganache over the nuts in the pastry shells - each tart will only hold a tablespoon or so. Chill for a few hours, or overnight. When ready to serve, swirl on a little whipped cream, a few crumbled hazelnuts, a tiny pinch of salt flakes and a whole caramelised hazelnut.